Size (Inches): 9 In. X 3 In. X 2 In., 9 In. X 4 In. X 3 In., All Sizes Available, 12 In. X 4 In. X 2 In. Our organization is involved in offering comprehensive range of Element Bricks that cater to the needs of Heat treatment industries. we can manufacture any shape and size as per the drawing offered by the customers. We are majorly looking for queries from Madhya Pradesh, Chhattisgarh, Maharashtra, Orissa, Andhra Pradesh and Rajasthan. 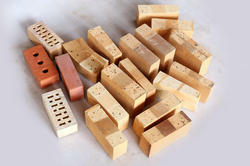 Our dedicated workforce helps us offer products such as Fire Bricks to our esteemed clients. 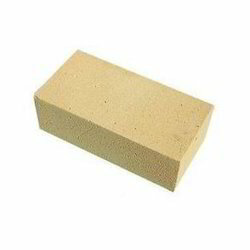 These bricks are supplied to clients in a wide range of specifications at leading market prices. Refractory shapes offers through its franchisee operations, fireclay and high alumina bricks ranging from 40% to 90% alumina. According to standard specification of clients..
Our clients can avail a wide range of Insulation Bricks from us that are manufactured as per the guidelines of industrial standards.